Volunteers bundled up and got to work on the National Mall Saturday morning with the goal of cleaning up around the Vietnam Veterans Memorial. See photos. 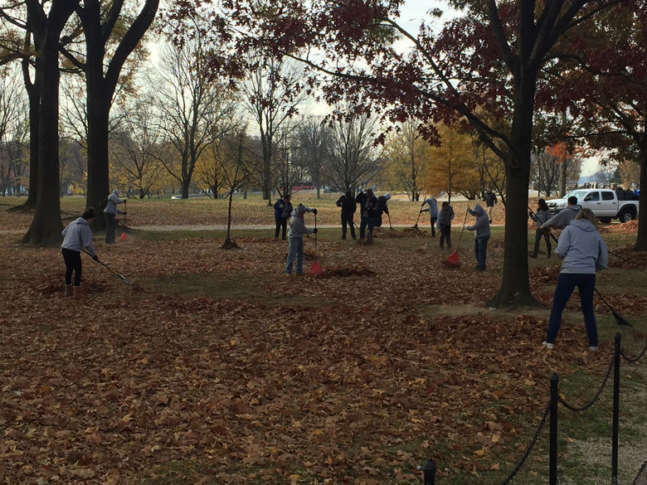 WASHINGTON — Dozens of volunteers bundled up and got to work on the National Mall Saturday morning with the goal of cleaning up around the Vietnam Veterans Memorial. The work they did would be along the lines of the kind of grunt work found on a “honey-do” list at home. The memorial may not have looked bad but volunteers wanted to do their part to make it look even nicer. The volunteers were part of the New Day USA Foundation, which helps spruce up the land around certain war memorials on a regular basis. “It’s very powerful,” Lynch said when asked about the meaning of this particular memorial carries for him. Several of his friends and classmates from the United States Naval Academy now have their names etched into the wall. After a sequence of speeches, the volunteers, in coordination with the National Park Service, went to work. Some of them, like Miles Thomas of Baltimore, started raking leaves near the wall. Closer to the wall, some volunteers worked a special vacuum to dig out pebbles that had fallen between the cracks of the stone walkway. Others got on their hands and knees and used sticks to dig up dirt, leaves and other types of debris from the drainage system that runs down the middle of the walkway. It’s in that section of the memorial that debris descends a few feet lower than the rest of the National Mall, and that drainage system helps disperse water before it causes any damaging flooding in the middle of the memorial. Shannon O’Brien of Boonsboro, Maryland, drove down to help get some of that debris out, while other volunteers swept it all up.